Save the Date – Walk on the Child’s Side 10th Anniversary School Funding Action! On June 16, 2009 at 11:00 AM, concerned citizens from around Wisconsin will gather at Library Mall on the UW-Madison campus and March to the State Capitol, bringing a message that comprehensive school funding reform cannot wait. 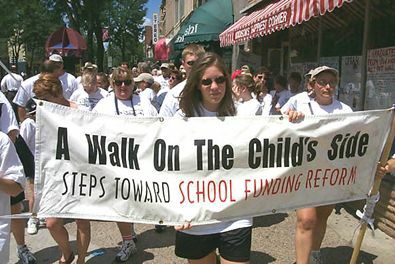 The event marks the tenth anniversary on the original “Walk on the Child’s Side.” In 1999 and subsequent years, Price County Citizen’s Who CARE (Committee for Alternative Revenues for Education) and their allies walked hundreds of miles from Northern Wisconsin to Madison, spreading the message that Wisconsin’s broken school funding system needs to be fixed (more history and information here). After 10 additional years of cuts to our children’s educational opportunities, the need for a fix is greater than ever! This message needs to be heard. Join the “Walk on the Child’s Side” veterans and newcomers to the struggle on June 16 and be part of the movement for change. The event is sponsored by Price County Citizens who CARE, The Northern Tier Uniserve, and the Wisconsin Alliance for Excellent Schools (check their web sites and on AMPS for updates).